As promised bridge number 39 is indeed right next to bridge 38. 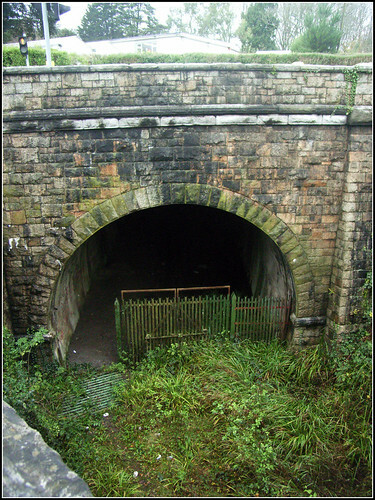 This is the entrance into Devonport Tunnel which took the railway underneath Devonport Park and Stoke. It actually passes a few feet underneath the other tunnel which takes the existing line under Albert Road. The tunnel is now closed off, although it seems the gate was down when i took this photo a few months ago. It used to really annoy me that this tunnel was closed. I used to live in Ford, right next to the large viaduct which crossed the Levans Valley. Had the bridge and tunnel been open I could have cycled to college here, all on the level. Instead I had to cycle up and down the steepest roads in Plymouth! I am still reading up on the railways of Plymouth as there are many gaps in my knowledge but hopefully I will be able to put a lot more detail to some of these posts in future! I take it you went to Kings Road instead of Goschen for College then? And I know what you mean, luckily it's all downhill for me when I have to go to St Leven Road to catch the 53 to work. It was Kings Road - The Gochen Centre didnt exist then - at least not as a College site anyway - still MOD base at that time.